Let f(x) be any polynomial of degree greater than or equal to one and let ‘ a‘ be any number. If f(x) is divided by the linear polynomial (x-a) then the remainder is f(a). Let f(x) be any polynomial with degree greater than or equal to 1. Further suppose that when f(x) is divided by a linear polynomial p(x) = ( x -a), the quotient is q(x) and the remainder is r(x). In other words , f(x) and p(x) are two polynomials such that the degree of f(x) degree of p(x) and p(x) 0 then we can find polynomials q(x) and r(x) such that, where r(x) = 0 or degree of r(x) < degree of g(x). So, for every real value of x, r(x) = k.
Hence the remainder when f(x) is divided by the linear polynomial (x-a) is f(a). (x -a) is a factor of f(x), if f(a) = 0. Given that f(x) is a polynomial of degree n 1 by reminder theorem. 2 . Conversely suppose that (x-a) is a factor of f(x). This implies that f(x) = ( x-a) . q(x) for some polynomial q(x). ∴ f(a) = ( a-a) . q(a) = 0. Hence f(a) = 0 when (x-a) is a factor of f(x). Then ax2 + bx + c = (px + q) (rx + s) = prx2 + (ps + qr)x + qs. This shows that ‘ b ‘ is the sum of two numbers ‘ ps ‘ & ‘ qr ‘ . Hence ( x+2 ) is a factor of x3 – 4x2 – 4x + 16 . Example – 5 : Find the values of p & q such that the polynomial x3 – px2 – 13x + q has ( x – 1) and ( x + 3 ) as factors. Also since (x +3) is a factor of f(x). Hi friends Thanks for reading. 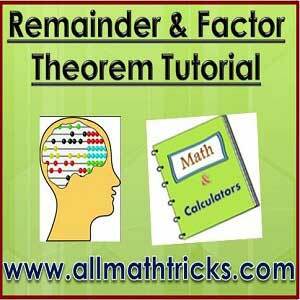 I Hope you liked this article ” remainder and factor theorem tutorial”. Give feed back, comments and please don’t forget to share it.